James Gray (1904-1998) was a local man whose passion for the streets of Brighton and Hove led him to amass a collection of over 7,500 topographical photographs. Gray worked all his life in insurance, and initially collected stamps; but in the 1950s he was offered a few images of Western Road. It was from this chance occurrence that Gray went on to build his wonderful collection of local images. 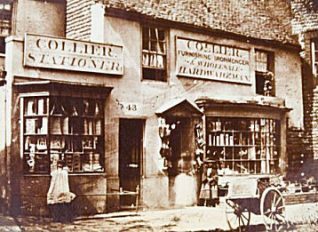 This sepia original is one of the oldest existing photographs of Brighton. It was taken in 1850, by Edward Fox, Jnr. then living next door at 44 Market Street. 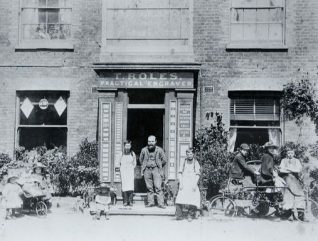 Today we are very aware of the significance of the James Gray photographic collection in terms of social history. Old photographs are much valued for the glimpse they allow us into the history of our city. When Gray started his work there was little concern for the need to chronicle the changing fabric of the area. It is thanks to his foresight and dedication to his task that we have such a unique record of these changes. On the death of James Gray, mindful of the historical and social significance of the photographic images, The Regency Society purchased the collection. It was their intention that the images should be made available for the use of researchers and others interested in the history of the city. By raising subscriptions to cover the cost, The Regency Society has digitised the whole collection which, together with James Gray’s notes and commentaries, can be viewed on their website. My Brighton and Hove, thanks to the co-operation of The Regency Society , has been given permission to reproduce images from the James Gray Collection on our website. We are very grateful for their help in our work of chronicling the history of our city. 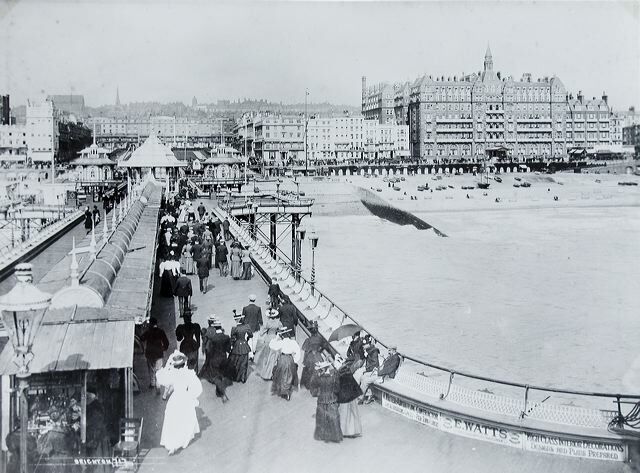 An undated photograph of the West Pier, Regency Square, and the Kings Road frontage. As to the date, one can only speculate. Obviously before the First World war, probably the early, or middle 1900’s. I have spent many an hour looking at the wonderful James Gray collection. Not visited yet? You are missing treat. I am sure my neighbour (who worked for the council) told me that he commissioned James Gray to take photos of the Brighton slums before they were cleared. He said James Gray used to come to the house I now live in with his huge portfolios of photos and would lay them out on the kitchen table. I will check details with him and post again. As Jennifer said, it is a wonderful collection of photos of Brighton and the surrounding area.When I was looking on the site to see if there were any shots of Blucher Place where we lived, I was amazed to see a picture of my gran Edith Taylor beside her house in 1960.The house had been compulsorily purchased and it went to a tribunal which my nan won.There are many photos of Artillery Street, Cannon Street, Cannon Place, Grenville Place, Russell Street, Upper Russell Street and many other streets. Also there is a photograph of Bardsley’s the best fish and chips in town. Looking back at those pictures was very nostalgic and very moving. I would like to thank the Regency Society for all their efforts in digitising the photos. I would definitely recommend the James Grey Collection. It truly is the most amazing collection of photographs. I spend hours looking through them, over and over again. Just in case anyone didn’t know, you can buy copies of images from the James Gray collection. Jot down the photograph’s reference number and pop off an e-mail to objectimages@brighton-hove.gov.uk. The costs vary, depending on what you want an image for and, if you want a print, how big. You’ll find the costs here: http://tinyurl.com/62nuhdk Every sale supports both the Regency Society and B&H museums. Quick declaration of interest – I’m the current (2011-2012) Regency Society treasurer and part of my job is to boost the society’s coffers. I am continually enthralled by the images, and being of a sufficient ‘vintage’ myself I can appreciate many of the locations photographed in the 1960s. As I revisit different areas of the collection, I notice more interesting subjects on each occasion. I feel I have to share my latest find – in a lot of the photos taken in the 1960s the photographer appears to have included his car in a lot of the shots. I refer to Hillman Minx SPM 400 – searching for the car has become an addiction. The James Gray collection is to me a look into the past as it would have been seen through my dad’s eyes. He was born in 1898 in Brighton and lived most of his life in Brighton until his passing in 1968. I spend hours looking through the collection and enjoy seeing places that were still recognisable as I remember them as a kid. On the other side of the camera I often wonder if James Gray got so much enjoyment in the darkroom as I have for over 40 years. He was probably using different chemicals and techniques in his day if he did his own processing and printing. The joys of the darkroom I will never forget, the mistakes and the discovering all about the work involved. I have loved it, (and spent far more money than I should have done on my hobby). I worked for James Gray at The General Accident Insurance during the 1960s. He was a truly remarkable man and the most wonderful boss I have ever worked for.